The application of functional analysis to infer networks in large datasets is potentially helpful to experimenters in various fields. In this paper, we develop a technique to construct networks of statistically significant transitions between variable pairs from a high-dimensional and multiscale dataset of teaching practices observed in Grade 5 and Grade 9 Mathematics classes obtained by the National Institute of Education in Singapore. From the Minimum Spanning Trees (MST) and Planar Maximally Filtered Graphs (PMFG) of the transition networks, we establish that teaching knowledge as truth and teacher-dominated talking serve as hubs for teaching practices in Singapore. These practices reflect a transmissionist model of teaching and learning. We also identify complex teacher-student-teacher-student interaction sequences of teaching practices that are over-represented in the data. In recent years, it has become popular to use networks to visualize and analyze the hierarchical structure within large datasets usually obtained from complex dynamical systems. Networks are especially useful for representing the extent and magnitude of interactions among the many components in complex systems. In such visualizations we show the important pair-wise relationships between variables. These relations may be directed transitions, causation, or activations, or undirected when we examine similarities or co-occurrences. Examples of such usage can be found in finance , , biology , , sociology , and language . Even without any further quantitative analysis of the network structure, showing such pair-wise relationships on a network often gives us a powerful overview of the structures that exist within the data. Beyond such crude ‘eyeballing’ of the network, there exist tools to (i) filter out the most essential structure in the network –, (ii) identify important central nodes, (iii) quantify the hierarchical structure , , (iv) identify important patterns or paths in the network , and (v) identify clusters of nodes , . Broadly speaking, there are two approaches to generate networks from data. First, some datasets such as air traffic data ,  and World Wide Web connectivity data  contain explicit information about the network structure. In other cases, we often have to infer the interactions among various components or variables by performing functional analysis on the data . Examples of this approach include the estimation of an undirected network of stocks based on the Pearson correlations of their daily returns , as well as the mapping of a directed functional network of brain regions from fMRI data using Granger causality as a directed measure . In both examples, the resulting network provides us deeper insights into the system it represents - clustering of stocks in similar industries in the stock market, and a functional hierarchy in the brain. We believe there is great potential in applying functional analysis to infer networks in large datasets under-utilized by experimenters in various fields. In 2010, the National Institute of Education (NIE) conducted a large-scale study of teaching practices in Singapore classrooms drawing on a representative national sample of schools. The study had the goal of investigating how teachers teach in Singapore, why they teach the way they do, and the effects of their teaching on student learning. The overall focus of the study was to map and model the logic of pedagogical instruction, the intellectual quality of knowledge work in classrooms, and the impact of instructional practice on student achievement while controlling for student and family characteristics. A total of 625 English and Mathematics lessons from Grades 5 and 9 classes were video-recorded and manually annotated for the presence of some 500 instructional indicators over the course of each lesson. These indicators focus on a broad range of organisational, instructional and interactional practices in the classroom, the knowledge and cognitive focus of teaching, the types of classroom talk and their knowledge content, how students respond, and the quality of the disciplinary knowledge of the subject-domain (English and Mathematics). The resulting data set is extremely high-dimensional (one dimension for each indicator) with greatly varying activities - some indicators are present up to 70% of the time while others appear only 0.001% of the time. 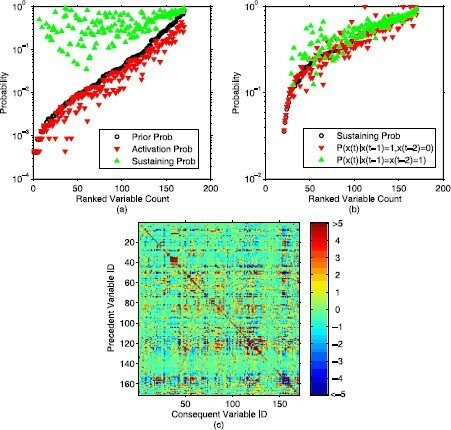 Using commercial software such as SPSS to analyse the large dataset proved to be computationally intensive, as it explores the combinatorially large space of variables to find statistically significant transitions. In particular, such commercial software was unable to perform complex temporal analysis of classroom pedagogy, which remains a major methodological challenge for educational research . In this paper, we describe a complex-network approach to the functional data collected in the NIE study. Our approach is both empirical and normative in that we focus, in the first instance, on establishing statistically weighted relationships between instructional practice and, in the second, because we assume that not all instructional practices are equal and that from a normative perspective, there is a particular logic to instruction that teachers need to attend to if they are to optimise the intellectual quality of teaching and learning in the classroom. As such, teaching and learning activities do not follow a random sequence but follow a purposeful and deliberate sequence that teachers implement from their lesson plans, and simultaneously adapt in response to their monitoring of students’ work. Effective teaching sequences, most often called learning progressions , , should lead to successful learning outcomes while ineffective sequences, perhaps due to structural weaknesses in the transition sequence, may not only have the opposite effect, but may disengage students from active learning in the long term. It follows that the resulting network of activity transitions should contain meaningful structures that correspond to actual teaching practices. The goals of this work are to (i) construct complex networks that typify activity transitions in the classroom, (ii) identify prevalent pairwise transitions and important practices, and (iii) extract sequences of transitions that frequently occur in the classroom. Since the focus of this paper is on the complex network methodology, we illustrate what the method is capable of discovering only for the data of Grade 5 and Grade 9 Mathematics. The data used in our analysis was obtained by the National Institute of Education through a comprehensive, large-scale, multi-dimensional, baseline study of descriptive and observational data on the state of instructional practices in Singapore classrooms. Known as the Core 2 Research Programme, it was a collaborative effort conducted by a team of over 35 research professors, research assistants and associates, and postdoctoral fellows and led by Professor David Hogan . The Core 2 Programme utilized a nested design comprising three distinct, inter-related, and analytical lines of research, each designated a ‘Panel’ with specific foci ranging from teacher and student beliefs, attitudes, and motivations (using surveys), classroom instructional practices (using videographic observations and coding), and assessment practices (using artefactual analysis). The anonymized data used for this paper is drawn from the observational and coding panel which videotaped and collected data from English and Mathematics teachers in 15 Primary schools and 16 Secondary schools. Grades 5 (in Primary schools) and 9 (in Secondary schools) were selected as these were considered to be years crucial to the development of skills and knowledge needed for the high stakes national examinations for Primary schools (the Singapore Primary School Leaving Examination) and Secondary schools (the General Cambridge ‘O’ Level Examination). English and Mathematics were selected as key curriculum areas that have a significant influence on student social mobility; literacy and numeracy skills are often seen as key leverages to opening up educational and career pathways. Data were collected from April through November 2010, resulting in 625 lessons (with 125-150 lessons per subject-level combination). Teachers selected for observation were asked to nominate a unit of work - a full sequence of lessons around a particular topic, theme or content area. Rather than discrete, random lessons for observation, the stipulation of a unit of work facilitates subsequent analyses that charts, models, and examines the developmental ebb and flow of knowledge and skills over time. Within the lessons in the unit of work, an average lesson may have the following typical pedagogical activities. At the start of the lesson, about 35 students are seated in the classroom, with student tables arranged in rows of pairs. When the teacher enters the front of the classroom, students would stand up, bow and greet the teacher. She would then proceed to use the computer equipment and projector, or the white board, to deliver the topical content for the lesson. Students would pay attention to the teacher as she teaches from the front, engaged in learning what the teacher has to lecture to them. The teacher may vary the largely teacher-led pedagogical activity by introducing mathematical activities, usually in the form of mathematics problem-solving worksheets, for students to practice on. Such practice work is typically done by students individually or in pairs. Students may sometimes proceed to the white board to demonstrate their understanding of problem-solving to the rest of the class. The teacher will check the students’ work by walking around the class, monitoring their mathematical practices and providing feedback when necessary. Upon ensuring that students are able to solve the problems in the worksheet, the teacher may proceed with teaching another, typically more procedurally complex, content, before getting students to practice again. This cycle of teacher lecture, student practice, teacher check and feedback, may continue until the teacher concludes the lesson with a short summary statement of what was taught for that lesson. Students would then rise, bow and thank the teacher for the lesson. All lessons are video and audio recorded using two to three high-definition video cameras and up to four audio recorders, with the aim to capture all whole class interactions and the majority of pair or group work. Lesson recordings are then coded by subject specialists who are intensively trained in the use of the Singapore Pedagogy Coding Scheme 2 , . Video recorded lessons, unlike in-situ classroom coding, afforded the detailed refinement of the coding scheme with the possibility of recoding to resolve any coding errors. Coded data are entered into Microsoft Excel and compiled in SPSS for statistical analyses. Each lesson is coded in three-minute ‘phases’, with an average one hour lesson having 20 phases. In each phase, the states of more than 500 possible listed variables (we use variables as a more general term for instructional practices) are coded through manual annotation. See Additional file 1 for detailed descriptions of the variables as well as the decision to code in three-minute phases. Segmenting the lesson into phases allows for a temporal examination of instructional practices from the start to the end of a lesson, and across the unit of work. From these 500 variables, we selected roughly 160 which are believed to be most essential to the development of the intellectual quality of knowledge work for our network analysis. The variables chosen extends current pedagogical research based on John Hattie’s research on ‘Visible Learning’ which describes effective pedagogical practices , by focusing on the nature of students doing disciplinary knowledge work in the classroom: the epistemic focus of instructional tasks; the nature of knowledge practices (including the generation, representation, communication and justification of knowledge claims); the epistemic classroom talk that helps makes these knowledge claims explicit, transparent and visible to students; and the cognitive complexity of the knowledge work undertaken in instructional tasks, recognising the contested nature of knowledge claims . These selected variables are coded as either active (1) or inactive (0) for each lesson phase. The starting point of our analysis is to define what constitutes a transition from one variable to another and from this, develop a measure of transition frequency and significance. Previous work in network analysis tended to use measures like conditional probability , transfer entropy , , or Pearson correlation  to denote the relationship between variable pairs. The major shortcoming in these measures when applied to discrete binary signals is that they do not consider the characteristic event durations, i.e. a signal that is activated continuously across several phases are assumed to be distinct events at each phase and treated independently. where x j l ( t ) is the state of variable j at phase t of lesson l, L is the total number of lessons for a particular subject-level combination and T l is the number of phases in lesson l. The procedure is illustrated in Figure 2. Comparison of Markov probabilities and colour map of correlations. In (a), the open circles are the prior probabilities P i (the probability of observing an active variable i at a given phase), the upwards pointing triangles are sustaining probabilities P ( x i ( t ) = 1 | x i ( t − 1 ) = 1 ) (the probability of observing an active i given that i is already active at a preceding phase), and the downwards pointing triangles are the first activation probabilities P ( x i ( t ) = 1 | x i ( t − 1 ) = 0 ) (the probability of observing an active i given that i inactive at a preceding phase). We ranked the variables in increasing order of prior probabilities. We see clearly that a vast majority of the sustaining probabilities are at least an order of magnitude larger than their corresponding prior probabilities. These variables have the tendency to self-sustain which suggests that we should treat multiple-phase activation of these variables as a single event. In (b) we compare the lag-1 sustaining probabilities against the probabilities P ( x i ( t ) = 1 | x i ( t − 1 ) = 1 , x i ( t − 2 ) = 0 ) and P ( x i ( t ) = 1 | x i ( t − 1 ) = 1 , x i ( t − 2 ) = 1 ) (i.e. treating variables as a lag-2 dynamical process). Unlike in (a), there is no clear increase in probability when the second preceding phase is accounted for. In (c) we show, on a colour map, the standard scores of observed conditional probabilities P observed ( x j ( t ) = 1 | x i ( t − 1 ) = 1 ) against their expected values if i and j were independent. If i and j were independent and characterized solely by their respective prior probabilities P i and P j , the expected conditional probabilities should be equal to the prior, i.e. P expected ( x j ( t ) = 1 | x i ( t − 1 ) = 1 ) = P j and the distribution of conditional probabilities should have a standard deviation of σ = P j ( 1 − P j ) / N i . The standard score is obtained from Z = ( P observed ( x j ( t ) = 1 | x i ( t − 1 ) = 1 ) − P j ) / σ . The colours on the map range from blue (lower than expected) to teal (equals expectation), and finally maroon (higher than expected). The dominant feature of this map is a diagonal of higher-than-expected conditional probabilities for self-transitions. Method of counting transitions. If we count all active state to active state transitions between variable pairs as shown in (a), there will be 5 transitions from variable A to B. This method assumes that every phase in which a variable is active is independent of its previous phase(s). If we assume that variables are activated in blocks, i.e. first activated at a particular time and then self-sustained for a duration, then it becomes reasonable to count transition frequencies as shown in (b). In (b), transitions always result in a variable’s first activation. We count two A to B transitions and one B to A transition. For two variables that are frequently active, the number of mutual first activations will also be large, even if they are causally unrelated. On the other hand, for two variables that are rarely active, even a small number of first activations may indicate strong causal relation between them if this number is larger than expected by chance. To test a transition frequency for statistical significance, we use the Monte Carlo sampling method described below. Given a pair of variables i and j that we assume are uncorrelated, we can create synthetic signals of each variable with their lag-1 Markov models using the Monte Carlo sampling scheme explained in Table 1. This is our null model for the observed transitions from i to j. We generated k = 10 , 000 synthetic signals x ˆ i , h l ( t ) , h = 1 , … , k for variable i, and x ˆ j , h l ( t ) , h = 1 , … , k for variable j and computed the total number of transitions N ˆ h , h = 1 , … , k as described in Equation (1) for each pair. The population of k transition frequencies form a distribution of N ˆ . Suppose P(0|0)=0.8, P(1|0)=1 − P(0|0)=0.2, P(0|1)=0.3, P(1|1)=1 − P(0|1)=0.7, and we start with x(1)=0. Then to generate a sequence using these transition probabilities, we draw 5 random numbers r = (0.52,0.86,0.67,0.23,0.91) uniformly from the interval [0,1) and allow x(t)=0 when r<P(0|0), x(t − 1)=0 and x(t)=0 when r<P(0|1), x(t − 1)=1. Since x(1)=0, to obtain x(2) we look at P(0|0). Since r(2)<P(0|0), x(2)=0. However, r(3)>P(0|0), giving x(3)=1. Iterating further, since x(3)=1, we look at P(0|1) and r(4)>P(0|1), x(4)=1. Then r(5)<P(0|1), x(5)=0. Finally, r(6)>P(0|0), and x(6)=1. The sequence we get is therefore x = (0,0,1,1,0,1). Let p be the fraction of the population of N ˆ that is larger than or equal to the observed number of transitions N observed ( j ← i ) . If p ≈ 0 then N observed is far above the mean of this distribution, there is a far greater number of observed transitions from i to j than expected from the null model which assumed the variables i and j were independent. If p ≈ 0.5 then N observed is close to the median of this distribution, and can be well explained by the null model. Finally, if p ≈ 1 then there are much fewer transitions than expected from the null model. N weighted ( i ← j ) = s N ( i ← j ) . For our analysis, we admit only edges where the significance s > 0.5 , i.e. p < 0.25 and thus there is 75% confidence that the transition is not spurious. Unfiltered network of significant transitions. Here, we show the network of all significant ( s > 0.5 ) transitions between variables from the data of Grade 5 Mathematics. The network is drawn with the following features: (i) node diameters are proportionate to the prior probability P i of their corresponding variables, (ii) arrowheads of the edges point in the direction from the precedent to the consequent, (iii) edges thicknesses are proportionate to the weighted frequency with thick lines denoting high weighted transition frequencies, and (iv) the placement of the nodes are determined by a multilevel force algorithm  that was included in the graphing software. 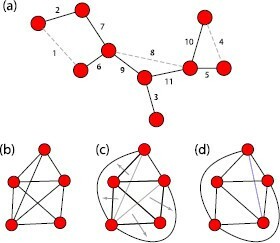 This algorithm assigns attractive and repulsive forces among nodes according to their connectedness and allows the graph to dynamically relax into a configuration of low energy. The multilevel treatment ensures that the graph relaxes into the global minimum energy configuration instead of being trapped in a local minimum. In this scheme, the distances between nodes are roughly inversely proportionate to the score between them i.e. a pair of nodes with high score will be placed closed together in the network. For this unfiltered network, the density of edges is so great that it is very difficult to discern any meaningful structure from it. For a network with N nodes, the MST is a subgraph where the N nodes are connected by the N − 1 most important edges. As its name implies, the MST is a tree, and therefore it can have no loops. It is constructed using Kruskal’s algorithm  as follows: (i) the edges of the network are ranked in decreasing order of weight, (ii) populate the MST with all nodes in the existing graph, (iii) starting from the edge with the largest weight, add an edge to the MST provided the edge added does not result in a closed loop, (iv) repeat (iii) until all nodes in the MST are connected. An example of the construction of a MST is shown in Figure 4(a). Construction of MST and PMFG graphs. The solid lines in (a) show a MST graph built from decreasing order of edge weights i.e. the edges with the highest weights are included first. The edges represented by dashed lines with weights 8, 4, and 1 are not included since they will result in loops in the network. (b), (c), and (d) shows the properties of the PMFG. Even though the edges in (b) intersect, the graph is planar. This is because the lines can easily be redrawn such that they do not intersect like in (c). However, if the new blue edge is added to the graph (d) there is no way to redraw the edges or rearrange the nodes such that the links never intersect. Therefore the graph in (d) is not planar. The PMFG filtering scheme, similar to the MST, admits edges in decreasing order of strength starting from the strongest link as long as the graph remains planar. Without elaborating on mathematical details, a planar graph is a graph that can in principle be embedded on a planar surface without any crossing of links (see Figure 4(b)-(d)). The PMFG retains more information ( 3 ( N − 2 ) links) while conserving all the hierarchical structure associated with the MST. More importantly, whereas the MST allows only a single possible undirected path between any pair of nodes (i.e. only the dominant pathways are preserved), the resulting PMFG is less restrictive and preserves several alternate paths that can be taken from one node to another. In Section 4.2, it was shown that many transitions taken in the most prevalent motifs are captured in alternate pathways preserved the PMFG but not in the MST. The fact that several important pedagogical transitions happen not along the dominant paths but the alternate paths suggests that the MST filtering is overly restrictive. Thus, in Figures 6(a) and 6(b), we chose to display the PMFG graphs and highlight their respective MST backbone. Beyond recognizing just the pairwise transitions between lesson variables, we also wish to identify important sequences of two or more significant transitions which we call dynamical motifs. These sequences enables us to track the progression of practices across many phases spanning a longer duration of a lesson. To do so, we return to the annotated data of individual lessons and search for frequently occurring sequences of significant transitions. This procedure is illustrated in a form of a time-resolved chart shown in Figure 5. Dynamical motifs identified are sequences that were repeated frequently over many lessons. Time-resolved transition chart. The time-resolved chart of a limited set for variables for a chosen lesson. Diagonal lines in the chart represent significant ( s > 0.5 ) transitions defined in Section 3.1. There are several paths in the chart which involves two or more transitions (three or more variables) and some of these paths are highlighted. For each path on the time-resolved chart there is a corresponding path in the time-integrated transition network. In Figures 6(a) and 6(b), the filtered graphs of weighted transition frequencies are shown for Grade 5 Mathematics and Grade 9 Mathematics respectively. We can observe that across both grade levels, teaching practices are organised around source (outgoing) hubs that correspond to Knowledge as Truth and Instructional Activity (IA): Teacher-Dominated Talk. These source hubs are characterized by a large concentration of significant outgoing transitions. Although these hubs also tend to be the most frequent practices, the frequency alone does not account for the large number of significant outgoing transitions. This suggests strongly that Knowledge as Truth and Instructional Activity (IA): Teacher-Dominated Talk are indeed important hubs that drive the initiation of teaching sequences. Transition networks of teaching practices during Mathematics lessons. The PMFG-filtered networks for (a) Grade 5 Mathematics and (b) Grade 9 Mathematics are drawn with features (i), (ii), and (iii) as described in Figure 3. We use dark edges to highlight the MST backbone of the PMFG network. The node placement was determined by the same multilevel force algorithm  in Figure 3 acted on the MST edges. We also indicate the community of the nodes in the graph by their colour. They are detected with a community-detection algorithm  that was built into the graphing software based on its MST backbone as well. The detection process, not guided by any pedagogy theory, nevertheless produced communities of variables that are in general agreement in pedagogy theory. For Grade 5 (Figure 6(a)), IA: Teacher-Dominated Talk is an especially generative node which leads to nodes such as Knowledge as Truth (via Supervisory Monitoring, where teachers monitor students’ behaviour in class), To Practice What Was Learnt (where students practice what teachers taught them), Procedural Talk (classroom talk about procedural knowledge), and Doing Mathematics Activity (students doing a mathematics task in a disciplinary manner). An attendant observation is that teacher responses during Doing Mathematics Activity tend to be short (one or two word responses such as “yes”, “good”, “well done”, etc.). But while Doing Mathematics Activity is a generative node in Grade 5, it all but disappears by Grade 9 (Figure 6(b)). We also note the presence of sink (incoming) hubs such as CD: To Practice What Was Learnt, IA: Individual Seatwork, and IS: Monitoring - Individual which attracts several significant incoming transitions. Unlike the source hubs, sink hubs are practices that occur much less frequently and are harder to detect. 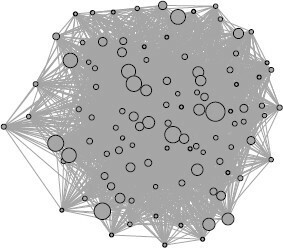 The network analysis methodology uniquely discerns these hubs with their special role. At Grade 9, Knowledge as Truth and IA: Teacher-Dominated Talk are still present as large hubs, but additional hubs have appeared: Procedural Talk, Procedural Knowledge Focus, Knowledge Communication Presentation and Knowledge Representation. The latter two hubs refer to how students present and communicate mathematical ideas (typically when asked by the teacher to present a problem solution on the white board in front of the classroom), and to how students represent mathematical ideas using different representational forms (typically abstract forms, rather than concrete or pictorial), respectively. Here, we find that while IA: Individual Seatwork and IS: Monitoring - Individual remain as prominent sink hubs for Grade 9, IS: Feedback to Individual Students has replaced CD: To Practice What Was Learnt in its role. The most common length-3 and length-4 motifs for Grade 5 and Grade 9 Mathematics are shown in Figure 7. A motif is said to be length-n if it consists of n − 1 successive significant transitions, but is not followed by an n th transition that is statistically significant. Some of the length-4 motifs contain a length-3 stem that branches out into more than one statistically significant fourth transition. Common lesson motifs. The most common motifs for both grades are listed here. For each grade, the first row lists the most common length-3 motifs that do not significantly extend to other variables and prevalence r gives the fraction of lessons in which the paths are present. The second and third rows present length-4 motifs. Motifs with broken arrows indicate the possible terminations of a common stem of three indicators. For these motifs we show r for each possible ending adjacent to the final node together with the total prevalence of all alternatives. As we can see, Grade 5 motifs typically show a common ‘cycle’ of teaching: The teacher starts talking about content (IA: Teacher-Dominated Talk, Knowledge as Truth, Procedural Talk); next, students are often given individual practice work (IA: Individual Seatwork); then, the teacher provides some feedback (Comment/Remark), returns to lengthy talk (IA: Teacher-Dominated Talk, Exposition), or asks the whole class a closed question which typically has one correct answer (Teacher Closed Question: WC). Sometimes, the sequences carry on with more practice work (CD: To Practice What Was Learnt, IA: Individual Seatwork) as well as the teacher’s monitoring of the student learning (IS: Monitoring - Individual, IS: Formative Monitoring, IS: Supervisory Monitoring) or providing individual feedback (IS: Feedback to Individual Students, IA: Individual Talk to Student). The Grade 9 motifs are largely similar to those in Grade 5, but with a greater focus on Procedural Knowledge Focus in the middle of the common motifs. Also, some Grade 9 lessons tend to end with the teacher providing a closing exposition (Teacher Exposition), lecture, and IRE (a form of talk where the teacher Initiates, the student Responds, and the teacher Evaluates) (Lecture, Lecture + IRE). Interestingly, there are motif links such as IA: Individual Seatwork to Teacher Exposition for Grade 5, Procedural Talk to IA: Individual Seatwork for Grade 5, and Procedural Knowledge Focus to IS: Monitoring - Individual for Grade 9 which are present in the collection of common motifs in Figure 7 while not appearing in their respective PMFG-filtered networks in Figure 6. The PMFG filtering scheme picks edges in descending order of statistical significance. However, because the statistical significances are time-integrated, there is no guarantee that successive transitions in the PMFG appear one after the other during actual lessons. These time-integrated transitions may be part of two motifs, one ending at the node that the other starts at. This is why a time-resolved analysis must also be carried out to identify dynamical motifs consisting of successive transitions that are statistically significant. The transmissionist model of teaching views teaching as a straightforward and unproblematic process of transferring information (knowledge) from the mind of the teacher to the mind of the student –. In this model, knowledge is a collection of facts about the world and procedures to solve problems; knowledge is objective, fixed, and external and learning is something akin to accumulating goods - but goods in the form of propositional knowledge, whether factual or conceptual; the goal of schooling is to transmit these facts and procedures from the teacher to the student; teachers know these facts and procedures, and their job is to transmit them to students; learning is an intra-subjective process that goes on inside students’ minds as knowledge is transferred or transmitted from the teacher to the student; simpler facts and procedures should be learned first, followed by progressively more complex facts and procedures; the way to determine the success of schooling is to test students to see how many of these facts and procedures they have acquired through well-established assessment procedures. 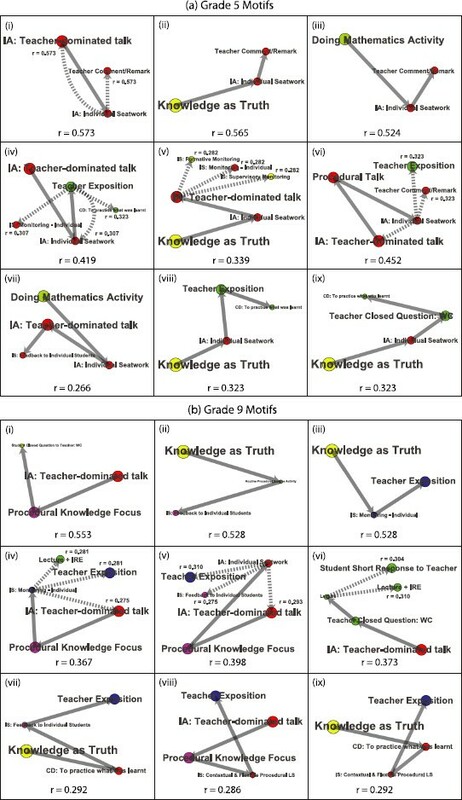 In the transition networks of both Grade 5 and Grade 9 Mathematics, Knowledge as Truth and Instructional Activity (IA): Teacher-Dominated Talk are seen as dominant hubs. Knowledge as Truth means that the knowledge that is presented in the lesson is viewed as non-contestable, non-negotiable and objectively valid. As an Instructional Activity (IA), Teacher-Dominated Talk means simply that the teacher does most of the talking in the classroom. These practices operate most effectively in the transmissionist model of teaching, since knowledge is unproblematic and non-contestable, and teachers need only to ensure that they cover the curriculum. Not the least of the opportunity costs for Teacher-Dominated Talk however, is that when students are not given the opportunity to engage in extended and productive discussions during lessons, misconceptions often go undetected, existing conceptual schemas can go unchallenged, students might become disengaged with the learning process, and over time, because they have less agency in the class to speak up, and lose motivation to become good students. However, as Ball  points out, mathematics instruction ought to involve a lot more than the transmission of facts and procedures. Above all, mathematics instruction should provide students with rich opportunities to engage in authentic, domain-specific mathematical practices. “Mathematics practices,” she goes on, “focus on the mathematical know-how, beyond content knowledge, that constitutes expertise in learning and using mathematics [such as] justifying claims, using symbolic notation efficiently, defining terms precisely, and making generalisations are examples of mathematical practices.” Thus, the transmissionist model is insufficient as a teaching and learning model for mathematics. In Grade 5, the strong presence of Doing Mathematics Activity is an important practice that we hoped to see in mathematics classrooms. Doing Mathematics Activity is inherently disciplinary in nature, and students need to acquire the mathematics-specific disciplinary skills, knowledge and disposition to understand mathematics deeply, debate, and discuss mathematical procedures and concepts, and appreciate the importance and relevance of mathematics. It captures the idea that mathematics learning does not consist purely of learning algorithmic procedures (captured in Procedural Talk and Procedural Knowledge Focus) and content (captured in Factual Talk and Factual Knowledge Focus), but requires students to perform discipline-specific knowledge practices as outlined by Ball. Similarly, Stein and Lane  characterize ‘doing mathematics’ as “The use of complex, non-algorithmic thinking to solve a task in which there is not a predictable, well-rehearsed approach or pathway explicitly suggested by the task, task instructions, or a worked out example. ‘Doing mathematics’ processes are often likened to the processes in which mathematicians engage when solving problems.” These activities are the most demanding of all activities, since they require the students to draw upon a range of mathematical knowledge and procedures/skills to complete some work that has no well-rehearsed way of completing the task. Instead, students are likely to be asked to design, test and justify a new procedure to fit a new kind of problem. The disappearance of Doing Mathematics Activity as a hub in Grade 9 suggests that at this level, the focus on what we consider to be a highly-valued disciplinary understanding of mathematics has been replaced by a focus on procedural knowledge (Procedural Knowledge Focus) as an effective and efficient means to present such knowledge, such as efficient problem solving methods. Yet, we believe that it is precisely because of this pedagogical approach focused on a highly proceduralised and efficient form of learning abstract mathematics that has made Singapore one of the top performing countries in international assessments that measure students’ ability in mathematics. Our observation confirms the PISA 2012 findings on Singapore Mathematics  which shows that there is a strong relationship between the teaching of Formal Mathematics (as opposed to Applied Mathematics or Word Problems) and student mathematical performance in the PISA tests. Finally, teaching and learning must be understood as a process. Christie  talks of the prototypical classroom lesson having a beginning, middle and end pattern. The beginning comprises some form of teacher direction (Curriculum Initiation), followed by the teacher and students’ sharing of direction (Curriculum Collaboration/Negotiation) and ending with students’ independent activity (Curriculum Closure). In the motifs we identified for Grade 5 and Grade 9, the didactic of teacher-student-teacher as well as teacher-student-teacher-student sequences highlights the complex interaction cycles that occur in mathematics classrooms. Almost all lessons begin, as described above, with a teacher-led initiation (Knowledge as Truth, Instructional Activity (IA): Teacher-Dominated Talk, Procedural Talk, Procedural Knowledge Focus). Often, these motifs lead immediately to individual practice work (IA: Individual Seatwork), seemingly replacing the middle phase of Christie’s pattern with student’s independent activity. Some motifs then terminate with feedback from the teacher in the form of lengthy talk (Teacher Comment/Remark, IA: Teacher-Dominated Talk, Teacher Exposition) following student’s practice work. These motifs suggest a teacher-dominated closure in the teaching pattern. However, in other motifs, we discovered a fourth movement which is a return to more practice work (CD: To Practice What Was Learnt) coupled with teacher’s monitoring of such practice work (IS: Monitoring - Individual, IS: Formative Monitoring, IS: Supervisory Monitoring). In Grade 9, the greater focus on Procedural Knowledge Focus is in line with the high stakes environment that Grade 9 teachers and students are entrenched in, requiring students to learn - at least a year early from the Grade 10 national examinations - procedures and practice skills that are necessary to perform well in the high stakes mathematics examination. Interestingly, when the focus is on Procedural Knowledge Focus, it is often followed by a more personalised approach where the teacher may provide individualised, specific, feedback (IS: Feedback to Individual Students) or learning support (IS: Contextual & Flexible Procedural LS). Such feedback and support are positive signs that rather than a summative exposition at the end (which does occur nevertheless), teachers and students have the opportunity to provide some feedback to one another. Expositions do end in about half of the motifs, likely due to the need to ensure that the important content and skills are reiterated and summarised, a necessary conclusion to the transmissionist model. In this work, we presented a technique of constructing transition networks from high-dimensional and multiscale data to allow for highly simplified analysis of interdependence and correlation. We applied the technique on teaching practices data obtained by the National Institute of Education in Singapore. We were able to identify and verify the dominant transitions between instructional practices and also pick out motifs of sequences of several practices and activities that are common in many lessons. We established that teaching practices of both Grade 5 and Grade 9 Mathematics lessons are organized around Knowledge as Truth and Instructional Activity (IA): Teacher-Dominated Talk hubs which exemplify the transmissionist model of teaching. In addition, a Doing Mathematics Activity hub is present in the Grade 5 transition network. This suggests that teaching practices at this level have incorporated exploratory elements into the pedagogy, a positive sign towards the goal of 21st century learning. In contrast, in Grade 9, disciplinary understanding of mathematics has been replaced by a focus on procedural knowledge, which nevertheless accounts for Singapore’s strong performance in international benchmarks. The motifs we extracted from the network highlight cycles of complex teacher-student-teacher-student sequences with great similarity between Grade 5 and Grade 9. In future work, this methodology will be employed and modified for more in-depth study of the transitions data. This includes using knowledge of the topology of the transition network to formulate strategies that can direct the flow of teaching activities towards a desired outcome. The data is drawn from a National Institute of Education project OER 20/09DH, Core 2 Research Programme (Panel 3), funded by the Office of Education Research, National Institute of Education. The project’s principal investigator is Professor David Hogan, and the co-principal investigators are Dr Phillip Towndrow and Dr Dennis Kwek. Data were collected and coded by over 15 research assistants and associates, led by Professor David Hogan, Dr Phillip Towndrow, Dr Dennis Kwek, and Dr Ridzuan Rahim. DH and DK provided the functionally coded data set, and the pedagogical conceptual framework for this study. They also jointly framed and interpreted the results of the data analysis. 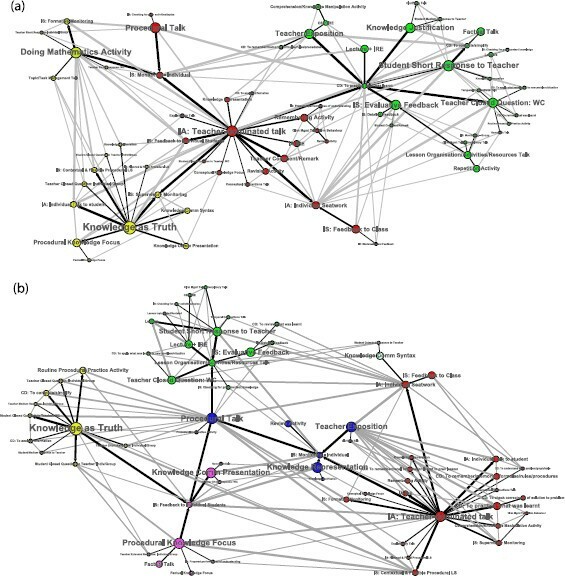 SAC and WPG developed the complex transitions network methodologies and tests for statistical significances, while WPG performed the data analysis. WPG, DK, SAC were principally responsible for writing the manuscript while DH reviewed and rewrote sections of the penultimate draft of the manuscript.